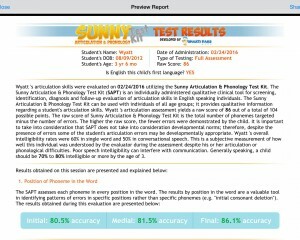 I was so excited to get to review the Sunny Articulation Phonology Test Kit App from Smarty Ears Apps because I have multiple preschoolers on my caseload with phonological disorders. Assessing them quickly and monitoring their progress is vital and this app will definitely help with that! Getting started with the app is very easy. Simply enter in a child’s name, gender, and birth date and you are ready to go! 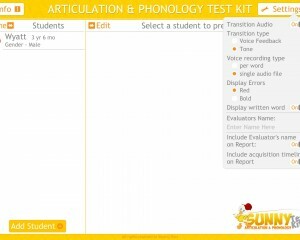 The Sunny Articulation Phonology Test Kit is unique in that you can choose to do a quick consonant screener, a full evaluation (you can choose whether or not to include vowels here, love that option! ), or just an R screener (also love this option so I don’t have to waste a bunch of time for kids with just “r” problems!) You can see your choices in the image below. For this review, I chose to do a full assessment. Once you click to start the assessment, you will be taken through a series of pictures. The word being tested is written phonetically at the top of the screen. 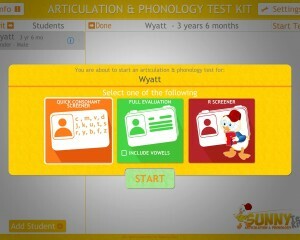 The phonemes being evaluated are highlighted. If a child makes an error, you simply tap on the phoneme in error and a menu will come up where you can select the type of error made. 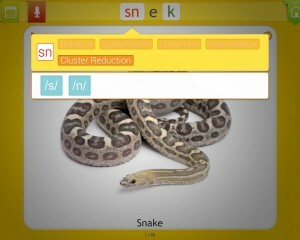 In the picture below, you can see that the child I was testing exhibited cluster reduction on the /sn/ in “snake”. Entering substitutions/omissions/etc. is so quick and easy! I love it! Another great feature is that you can record the child’s productions which is very helpful for later reference. The full assessment (without vowels) is 46 pictures long. A little long for my preschoolers attention span, but the iPad helped with the attention aspect! I found the pictures to all be very appropriate for even preschool age students with only a few exceptions (olive was tough!). After you complete the assessment you can also choose whether to also assess at the sentence level which is a fantastic option. You also enter in a subjective judgement of overall intelligibility rate at the single word and conversational level. Another nice feature is that you can turn on or off whether you want articulation sound norms to show up in the report. My district has specific norms we use so I appreciate the option to take this out. You can see this option and the other setting you can change in the image below. I found the app very user friendly. It provided me with a wealth of information about my articulation and phonology students. It will be a terrific resource for progress monitoring, quick screenings, and full evaluations! 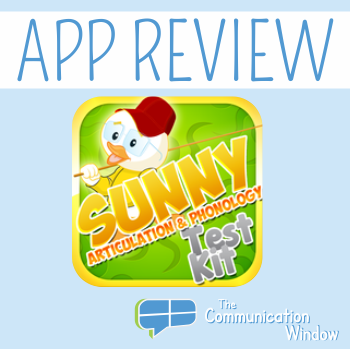 The Sunny Articulation Phonology Test Kit is available in the iTunes store for $49.99. Disclaimer: I was provided a free copy of this app for review and no further compensation. All opinions expressed are my own.